Lobbying is the art and the skill of creating opportunities to move good ideas forward or to stop bad ideas from advancing. In the public policy arena, achieving these goals requires establishing relationships with those who can help articulate your position and advocate for you. At Triad, we align our clients with the entire range of people and institutions who can help – elected representatives, the executive branch, regulators, local governments, advocacy groups and others. Triad’s principals and associates have a wealth of expertise in a multitude of public policy areas, including agriculture, appropriations, banking, gaming, education, energy, health care, labor relations, procurement, public finance, technology and transportation. Our strategic partnership with DTI Development gives us a level of economic development expertise that few firms possess. Government grants, loan guarantees, tax increment financing, earmarks, program monies and other public funding opportunities require a thorough understanding of the appropriation process. In Pennsylvania, many of these opportunities are not easily identifiable to those unfamiliar with the budget and legislative process. At Triad, we have a proven record of success in obtaining public dollars for our clients. With the dramatic reductions in discretionary funding now impacting all levels of government, these skills have become even more important as available funding sources become fewer and ever more constrained. If your company wishes to provide goods and services to the government, Triad Strategies has you covered. In an era where more and more government services are privatized, opportunities abound. Whether it’s a local borough bidding public works jobs, state government goods and services contracts, or securing federal stimulus funding, Triad’s seasoned team of former government officials and others have the inside track on what it takes to put you on your way to landing that prized contract. We know the policies, regulations and requirements that your business needs to fulfill in order to be eligible, and we can get you in front of the decision makers when the time comes. Contributing to candidates who espouse your organization’s beliefs and values is an important part of the political process. But navigating the maze of rules and prohibitions that affect political fundraising can be overwhelming, especially since those rules change constantly, and vary significantly by jurisdiction. Our decades of combined fundraising, campaigning and fiscal oversight experience enables us to handle all of your political funding needs, from establishing a political action committee, to orchestrating fundraising campaigns, to filing the necessary reports, to utilizing the latest trends and technologies. There’s strength in numbers, and this is especially true when it comes to political or legislative organizing. One company alone has little impact when it comes to forcing legislative or regulatory change, but bring 100 companies together with a common purpose, and the roar can be deafening. Triad has extensive organizing and administrative experience in bringing together diverse groups or individuals for collective purpose. We have been privileged to represent some of the largest statewide associations, and have also created some from the ground up around specific issues. We understand group dynamics and what it takes to forge common purpose among groups with varying interests. More than 5,000 bills are introduced in the Pennsylvania General Assembly each year, and you can bet more than a few could impact your organization. Can you track them all, analyze them all, and watch their movements? We can, and do, every day. 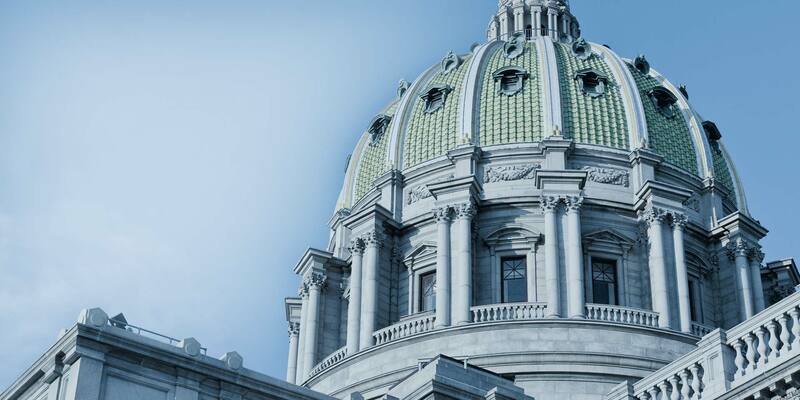 With 253 state legislators in Pennsylvania, 535 members of Congress, and thousands of government administrators in between, an avalanche of legislative initiatives awaits the unsuspecting business owner or advocacy group. Let Triad take the legwork out of an issue for you. Our sophisticated monitoring strategies and expert analysis helps you stay abreast of the legislative process, without the expense or inconvenience. Triad knows Pennsylvania issues. We have to. If you follow our Twitter feed or Facebook page, you will see us sharing content each day on issues affecting organizations across the state. Whether it’s the latest taxing proposal for shale oil drilling, pension reform, or a gubernatorial candidate’s position on basic education, our clients expect accurate and timely information on a wealth of issues and activities. Triad’s diverse team of professionals maintains an ongoing tracking and monitoring strategy around the issues that affect your company, organization, and ultimately, your bottom line. If it affects you, we’ll know about it, often before you do. Work with Triad, and you will know what we know.